Norbert Dudek (L), vice president and general manager, Terex Cranes Asia, and Ang Kah Hong, chairman and chief executive officer, TWC. 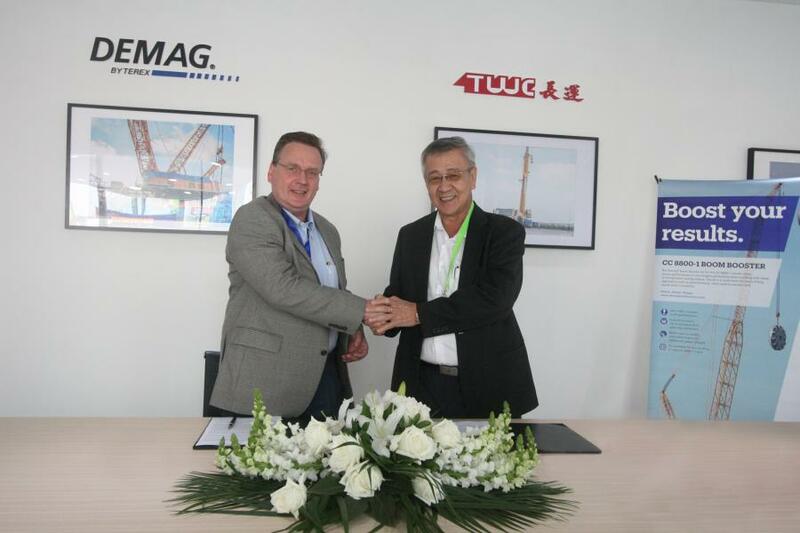 Singapore-based heavy lift and haulage service provider Tiong Woon Corporation (TWC) entered into a sales agreement for the delivery of a Boom Booster kit for its three Demag CC 8800-1 crawler cranes, which are now in service, at this year's bauma in China. The contract was signed on Nov. 28, 2018, at the Terex booth in Shanghai. "We consider the Demag CC 8800-1 to be synonymous with quality, reliability, and powerful performance characteristics. And while its large lifting capacity of up to 1,600 tonnes is impressive, the Boom Booster increases the lifting capacity of the existing CC 8800-1, making the CC 8800-1 superior to any other crane in the class of up to 2,000 tonnes. We are constantly upgrading our capacity and exploring ways to be more efficient by providing integrated solutions for our clients to meet their heavy lifting requirements," said Ang Kah Hong, chairman and chief executive officer of TWC, explaining his company's purchase decision. The two companies have had a long and fruitful business relationship that is marked by trust, and Terex Cranes Asia Vice President Norbert Dudek had nothing but praise for it as the contract was being signed. "We value TWC as an extremely important and significant customer. And of course we are very pleased about the renewed vote of confidence with the purchase of our Boom Booster kit, which will significantly enhance the performance and cost-effectiveness of TWC's Demag CC 8800-1 crawler cranes," Dudek said. The Boom Booster kit can either be ordered directly with a new crane or retrofitted as a kit for cranes already delivered. Tiong Woon Corporation Holding Ltd., which is headquartered in Singapore, is one of the world's leading specialists in heavy lifts. In its role as a full-service provider, the company primarily works with the oil and gas petrochemical industry and in the areas of infrastructure and construction, and uses its own heavy-duty cranes and transport vehicles for this purpose. In addition to its headquarters in Singapore, Tiong Woon has branches in Malaysia, Indonesia, Thailand, the Philippines, Vietnam, China, Sri Lanka, India and Saudi Arabia.